The magic, heart and soul of KISS is their live performance. 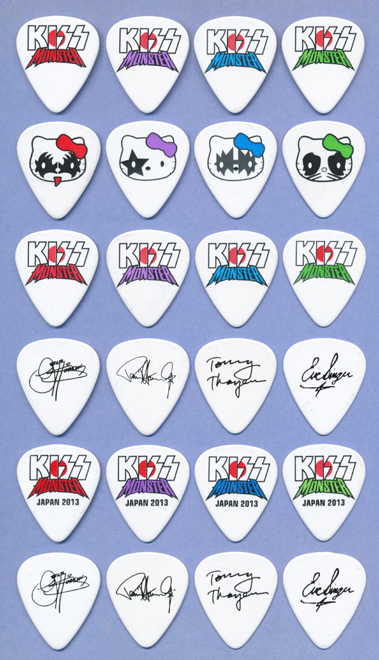 While KISS is world renowned for their merchandising, to many fans, concert used items are far more precious. 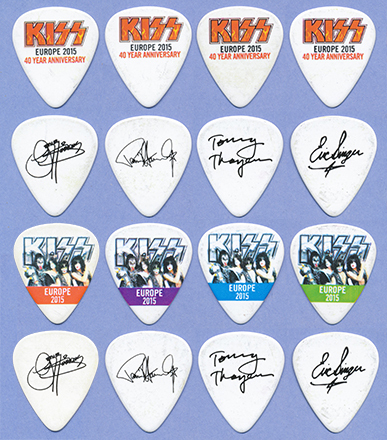 This historical look at KISS tour used guitar picks is dedicated to the band and its fans. 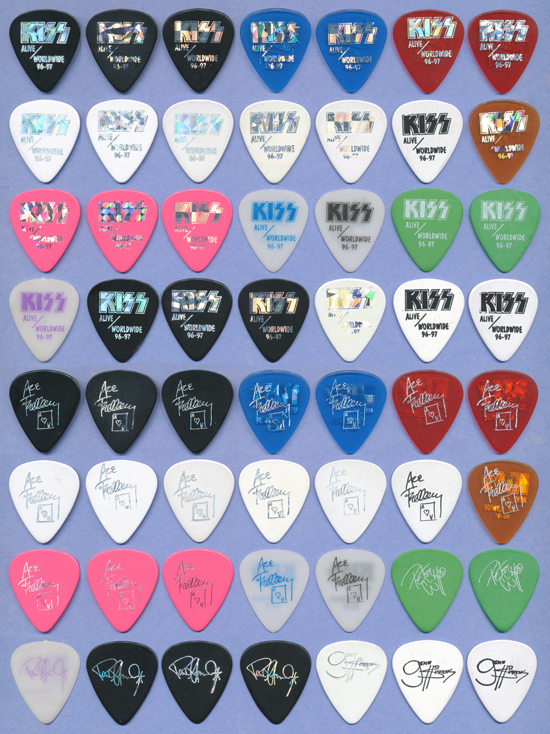 All of these picks shown on this page are in my collection except for the few described in this color green. As you can see, I am getting very, very close to complete! 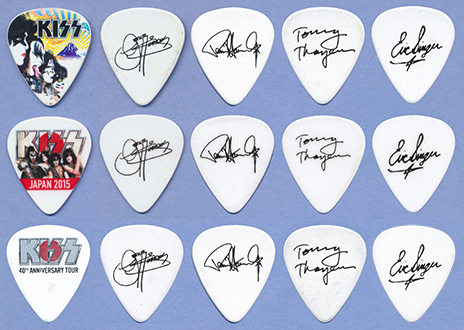 I am very interested in obtaining these picks if you or someone you know have them to offer! Feel free to contact me if you have one of the ones I need! 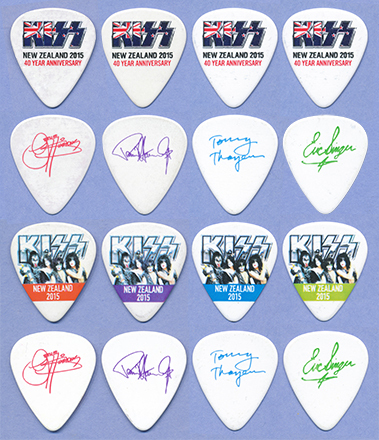 I've assigned a numbering scheme to be able to differentiate between the picks when describing them, especially when multiple variations arise within the same tour. 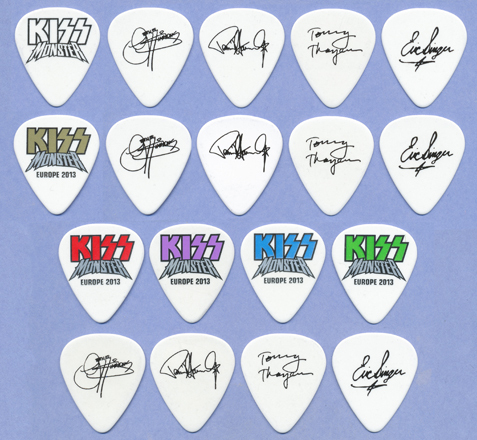 Note that many of the variations are the result of the pick companies producing the picks with whatever materials they have (e.g., off-white instead of white or dot prism instead of fractured prism), not as a result of the band ordering a particular variance. 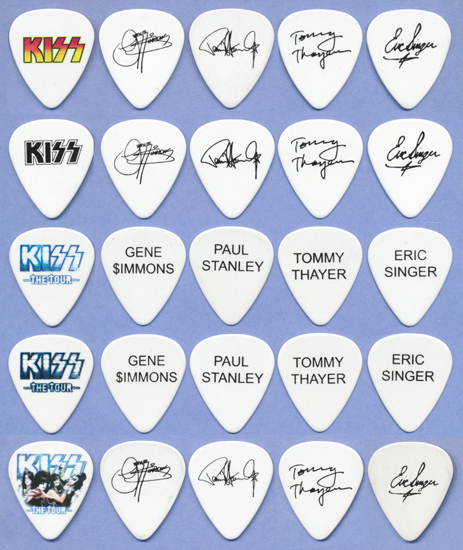 Note: Before making it big, KISS relied on generic picks. 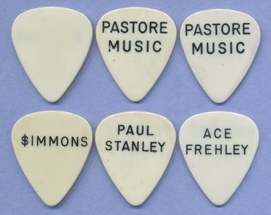 When then band purchased equipment, music stores would often throw in picks on the deal as a way of advertising, such as this one from Gracin's & Towne Music (see p. 5 of KISStory). All 3 members would likely have used similar picks. This one happens to be one of Ace's. 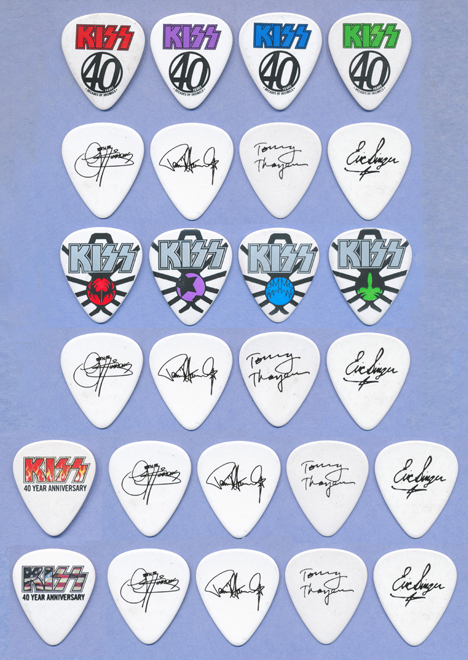 Note: These are the first KISS signature picks. Pastore Music Store outfitted many big name bands in the 1970's. KISS was one of them. Gene did not have Pastore Music on his pick. 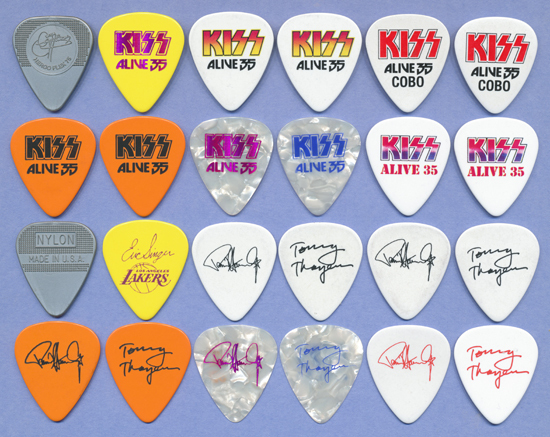 Note: This Ace pick shown is likely from the very first batch of logo picks ever printed. The plastic is the same semi-transparent white stock as the Pastores. 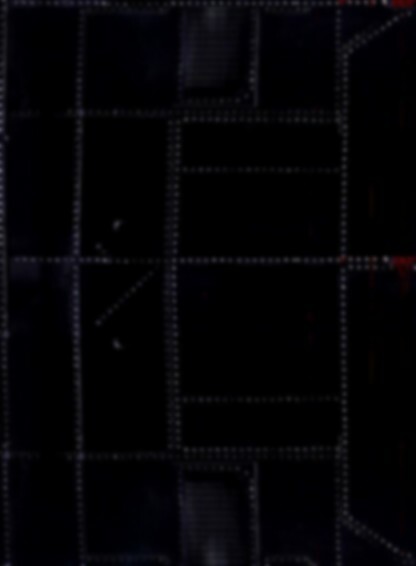 And the top right corner of the I in KISS is not nicked, which indicates it was printed when the mold was still new prior to being damaged. 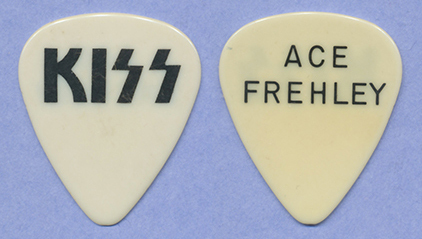 Note: The Ace pick shown above was obtained at the famous Lakeland, FL show where Ace was 'electrocuted', creating the inspiration for the song "Shock Me". 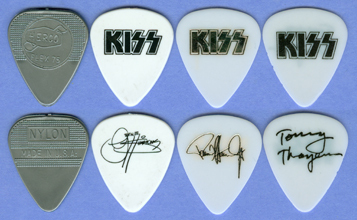 Note: Although these picks were not used on tour until June 1979, they actually were used for the first time during the famous May 19, 1978 Magic Mountain show during the filming of the movie "KISS Meets The Phantom Of The Park". KISS appeared at ABC Studios in Burbank, CA on 1/15/82 for the television show Friday's. It was the only time songs off "Music From The Elder" were played live until MTV Unplugged in 1995. 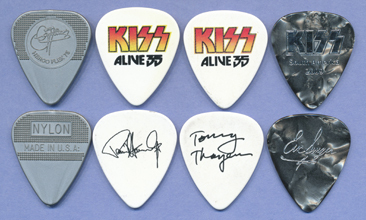 These picks (except the Ace which is shown here for demonstration purposes only) came from the collection of John Nicolary who was present at the taping. John's story was written up in many fanzines back then. Flex 75" and the other side says "NYLON [over] Made in U.S.A."
Note: Style 1 were used throughout Europe. They truly were just leftovers from the 10th Anniversary tour. Note: When the Animalize tour was set to kick off in the Fall of 1984 in Europe, Mark St. John was unable to perform due to Reiter's Syndrome. So Bruce Kulick was hired to play the concert dates. As the tour moved to the USA, Mark was still not well enough to play. Eventually Mark did jump in for 3 shows but realized he was not well enough for the rigors of a full tour. It would not have been fair to have Bruce throw out Mark picks, nor did KISS want to start a rumor that Bruce was officially in the band. So blank back picks were made as a compromise to throw into the crowd. 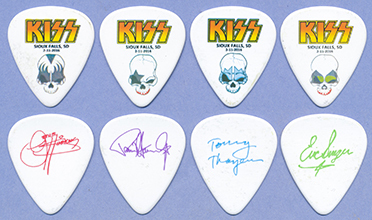 Notes: The picks from this tour featured a large outlined logo. 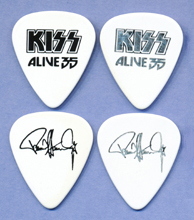 Gene & Paul used Alive II signatures. Bruce's is new. The brown picks were used very sparingly, mostly in the Chicago area. Used only in the UK during the final shows of the tour. 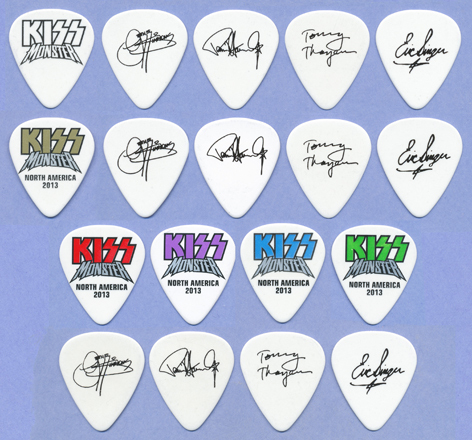 Notes: The picks from this tour featured a much smaller logo and the same signatures a Asylum. The logos tended to be closer to the middle of the pick and much brighter gold print was used. 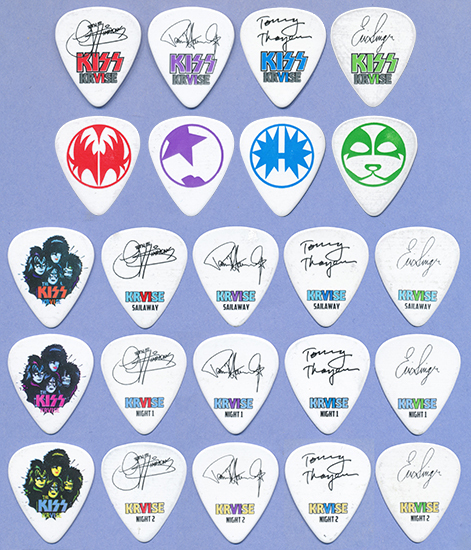 Notes: The picks from this tour featured essentially the same designs and signatures as Crazy Nights, but the logos tended to be closer to the top of the pick and a slightly different shade of gold print was used by the manufacturer. One could also argue the logo was just a millimeter larger, and a slightly lighter shade of gold. 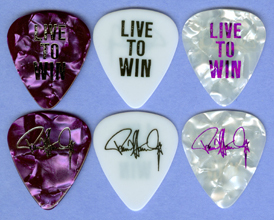 Note: For the first time, Bruce's natural signature appears on a pick. Prior to this point, he used a more legible signature he had practiced when he first became an official member of the band so fans would be able to learn his name. 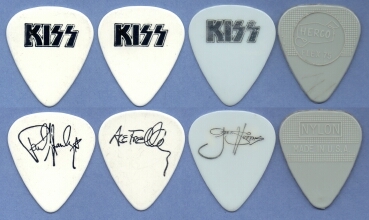 REU-GS4 - HERCO - silvery gray pick -no KISS logo (referred to as a 1-HERCO) - used by Gene when his hands get slippery. One side says "HERCO [over] Flex 75" and the other side says "NYLON [over] Made in U.S.A.". 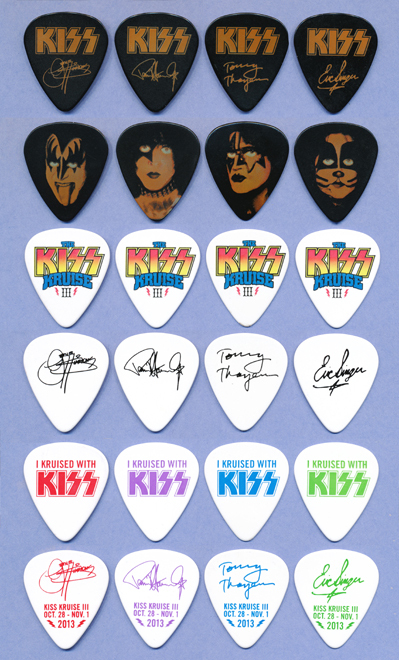 Note: Creative Communications sold KISS phone cards (for only $10) that came with replicas of the Reunion picks. These can be seen on the Novelty Picks page. 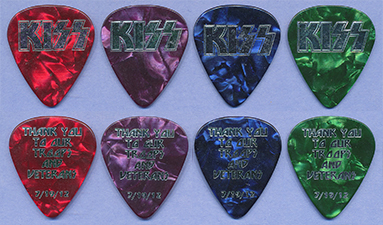 Most of the colors are different, but a couple mirror the actual tour picks. The way to tell them apart is the tour picks have a dash between 96 and 97. The phone card picks do not have the dash. PSY-GS3 - HERCO - silvery gray pick - used by Gene when his hands get slippery. One side says "HERCO [over] Flex 75" and the other side says "NYLON [over] Made in U.S.A.". 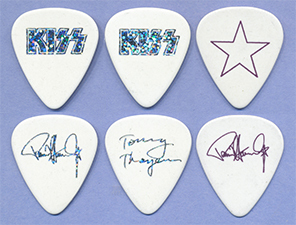 Note: The band started out the tour with new, smaller, glossy picks made by Dunlop using the new signatures which first appeared on the Psycho Circus picks sold at Spencer's. Ace quickly reverted back to D'Andrea made picks. 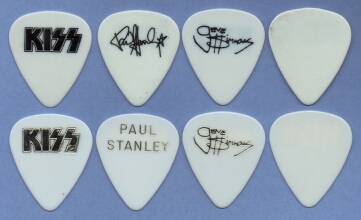 Paul used the Dunlop picks through the majority of the tour. 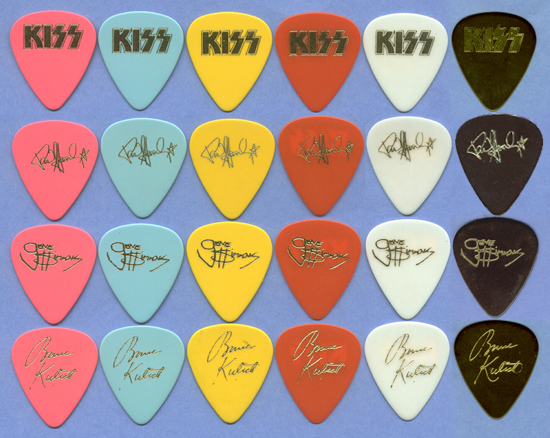 Gene stuck with the Dunlop picks for the entire tour, but played with his Hercos most of the time. 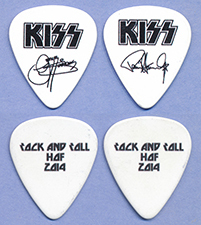 FAR-GS2 - HERCO - silvery gray pick - no KISS logo (referred to as a 1-HERCO) - used by Gene when his hands get slippery. One side says "HERCO [over] Flex 75" and the other side says "NYLON [over] Made in U.S.A.". 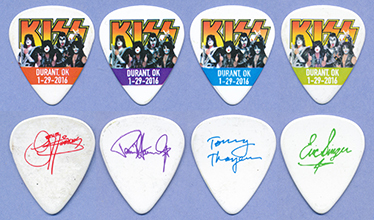 Note: Eric Singer replaced Peter for the Pacific leg of the tour and tossed these picks out. 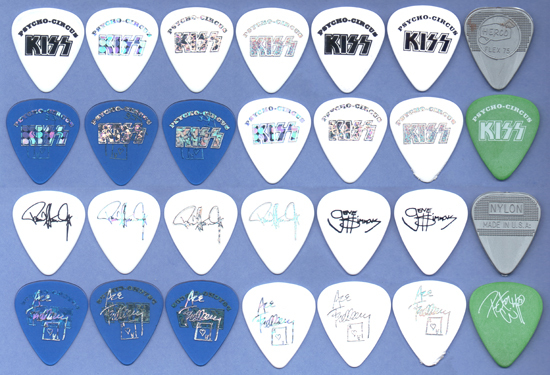 Ace arranged for individualized picks for every show on the Farewell tour in numerous combinations of prisms and colors. Ace designed the backside artwork and chose the color combinations himself! He tossed up to 44 per show. 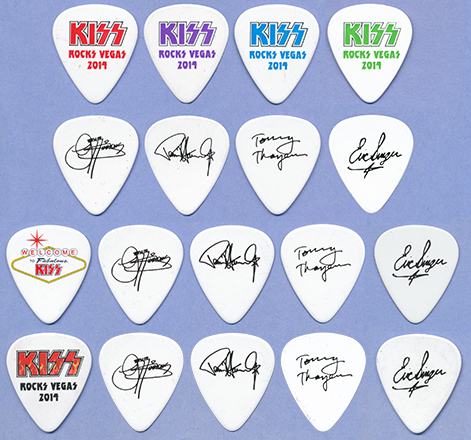 Picks were made for the shows prior to Chicago, but they did not arrive in time for Ace to use, so I have placed those on the Prototype Picks page. The first Minneapolis pick is dated 5/17 but the show was actually played on 5/18 because the band could not get out of their Chicago base due to poor weather. The dates for the Calgary and Edmonton shows are reversed. The first two Australia shows mistakenly have Louisiana in the background. 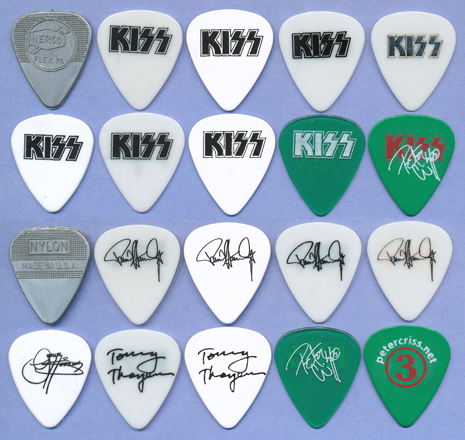 WDT-GS1 - HERCO - silvery gray pick - no KISS logo (referred to as a 1-HERCO) - used by Gene almost exclusively on this tour. One side says "HERCO [over] Flex 75" and the other side says "NYLON [over] Made in U.S.A.". 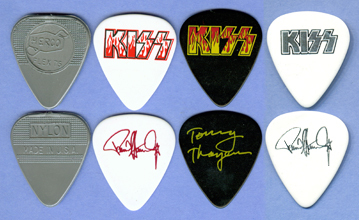 RTN-GS1 - HERCO - silvery gray pick - no KISS logo (referred to as a 1-HERCO) - used exclusively by Gene on this tour. One side says "HERCO [over] Flex 75" and the other side says "NYLON [over] Made in U.S.A.". HON-GS1 - HERCO - silvery gray pick - no KISS logo (referred to as a 1-HERCO) - One side says "HERCO [over] Flex 75" and the other side says "NYLON [over] Made in U.S.A.". RST-GS1 - HERCO - silvery gray pick - no KISS logo (referred to as a 1-HERCO) - One side says "HERCO [over] Flex 75" and the other side says "NYLON [over] Made in U.S.A.". HNR-GS1 - HERCO - silvery gray pick - no KISS logo (referred to as a 1-HERCO) - One side says "HERCO [over] Flex 75" and the other side says "NYLON [over] Made in U.S.A.". 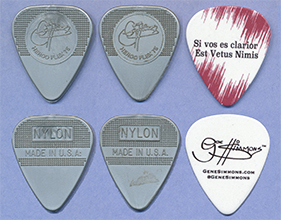 A35-GS1 - HERCO - silvery gray pick - no KISS logo (referred to as a 1-HERCO) - One side says "HERCO [over] Flex 75" and the other side says "NYLON [over] Made in U.S.A.". 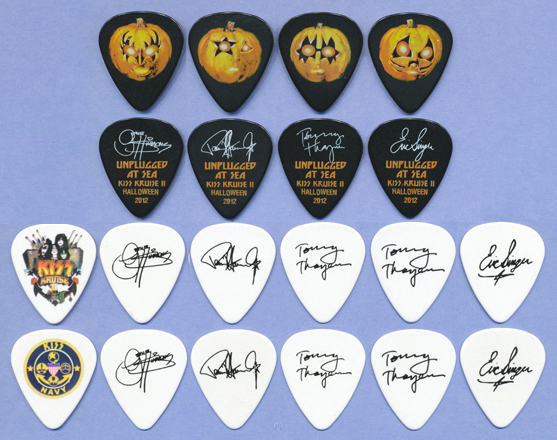 In addition to these common picks, the band also had city picks available which can be seen by clicking anywhere on this sentence. THE-PS1 - Dunlop - orange & yellow logo on solid white - outlined logo / Alive 35 signature (pad printed) used for the San Juan, PR, Houston, TX and Hollywood, FL shows) Note: Logo is smaller than the 2008 version. THE-TT1 - Dunlop - orange & yellow logo on solid white - outlined logo / Alive 35 signature (pad printed) used for the San Juan, PR, Houston, TX and Hollywood, FL shows) Note: Logo is smaller than the 2008 version. NOTE: From this point forward, I am going to discontinue listing Gene's Herco with every set. Suffice it to say, Gene prefers to play with Hercos over any signature pick, which are mostly on his mic stand for decoration and fan souvenirs. Should a new version or variation of the Herco develop, I will add it. NOTE: Only used for an exclusive, private show for 2,000 military members and their families at the Jiffy Lube Center in Bristow, VA the night before the kick-off of the tour. 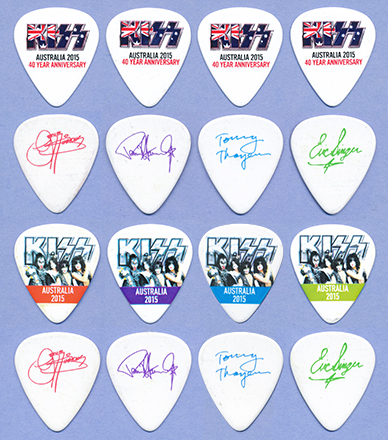 In addition to these common picks, the band also had city picks available (starting with Australia) which can be seen by clicking anywhere on this sentence. Note: These were originally to be used for the March 15th appearance in Mexico City, but the festival was canceled by the local government. It was eventually rescheduled for October 25th. 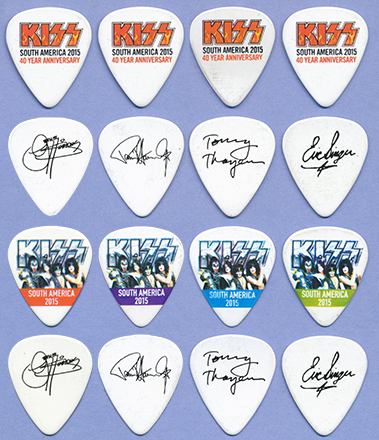 Note: These were used for the free concerts for LA KISS season ticket holders. KISS appeared in Los Angeles, CA on 12/13/16 for the Season finale of the NBC television show "The Voice" with finalist, Sundance Head. They played a medley of "Detroit Rock City" and "Rock And Roll All Nite". At the end of the broadcast, Head was crowned winner of "The Voice" Season 11 . 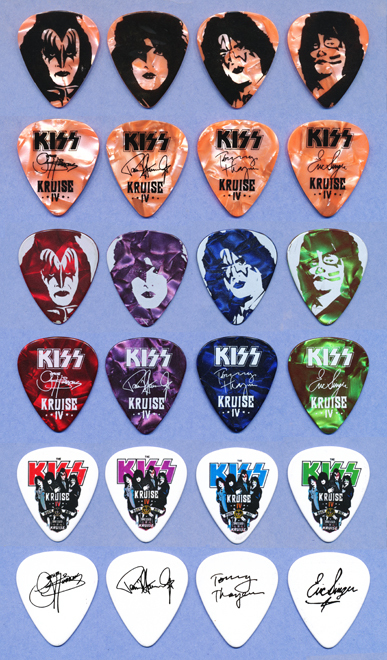 Note: KISS used these picks for a private show on October 22nd for In-N-Out Burgers' 70th anniversary, The Late Late Show with James Corden on October 29th and The Tonight Show with Jimmy Fallon on October 30th. 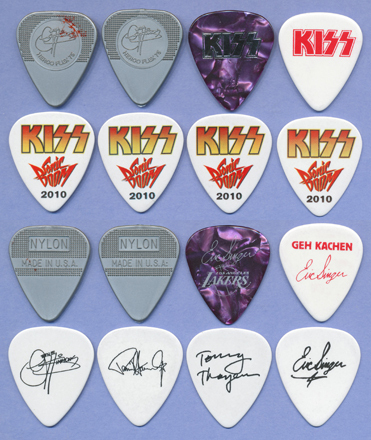 PLEASE contact me if you have any KISS guitar picks that I do not have! All text and photos posted on this page are the sole property of Ken Rodenas. Any copying, reproduction or use of these texts or images without the express written consent of Ken Rodenas is strictly prohibited. This unofficial, fan based, non-profit site is not associated with KISS Corp. or Live Nation in any way.